Which is the Best Plasma Cutter for the Money? We’ve pooled our technical know-how and on-the-job experience to research the best plasma cutters on the market right now! We’ve thought about all the key factors: power, reliability, efficiency, and price. As we compared models, we also took the time to read as many reviews, both professional and buyer, as we could. We wanted to get a sense of the user-friendliness and long term durability of these machines in the real world. In the end, we picked 6 great tools to recommend for this guide. We chose them to suit a variety of needs, as well as budgets. We’ve written our own in-depth reviews for each tool in this guide, and we’ve also put together a quick checklist to help you find your perfect fit. To get started, let’s take a look at three of our favorite models! If you work in a shop, as a mechanic, or just do lots of repairs and projects around your house, a plasma cutter will make your life infinitely easier. Plasma cutters work much more smoothly than grinding. They’re more precise, leave cleaner edges, and don’t waste as much metal. However, plasma cutters are both more expensive and more technically involved than a metal grinder. Since these tools can be a major investment, it’s very important to make sure you’re getting a quality product. For those of us who aren’t engineers, it can be hard to navigate the plasma cutter market. These tools are very technical, and have lots of specs and intricate features which need to be compared before you make a purchase. Plus, each plasma cutter is optimized for certain types of metal and projects. The reviews below will help you figure out exactly what you need in your new machine and which models can help you achieve your goals! This Lotos model is our most budget-friendly recommendation. It’s a compact, lightweight cutter which packs a surprising amount of power for a unit of its size. We like the dual voltage versatility, as well as the ample room for modification. Previous buyers report great results on 1/2″ steel, and say they’re amazed at how good this machine is for its size and price. This is a good choice for the casual DIY enthusiast, or the budget-minded shop worker responsible for light metalworking tasks. It’s extremely affordable. For people who need to cut only occasionally, the Lotos is a good way to get the benefits of a plasma cutter without the exorbitant price tag. It’s available for well under $500, hundreds of dollars less than other cutters. It works on two voltages, 110 or 220. 110 is more commonly wired in smaller shops, as well as general household systems. It’s suitable for lighter work, and cutting thinner materials. 220 is what you’ll want for heavy duty use, or in a busy shop. The versatility is a big plus on a budget cutter, since many plasma units only work on one voltage. If you buy a machine designed only for 220, you’ll have to spend money to have your power company install a special hookup. That’s not a problem with this one. It has a special PAPST cooling system, engineered in Germany. Most other Asian-made machines at this price have pretty poor cooling system, so the PAPST unit in this really makes it stand out. According to the manufacturer’s rating, it cuts up to ½”. You can sever metals up to ¾”. While previous buyers said it’s not quite as smooth at those greater depths, they did say that they were surprised by how well it worked. Many said they were cutting perfectly at 1/2″ steel, which is all you’ll really need for most DIY projects. It works even better on thinner metals, leaving surprisingly smooth edges. Previous buyers said it can take a few test cuts to figure out the right distance to use, but once they had figured it out, the job went smoothly. That’s a lot of value for money in terms of sheer cutting capacity, which is why we think this one is a great bargain! Lotos have recently redesigned the trigger head torch attachment for this model. The updated torch trigger is removable so you can customize the grip. We like that it also works in both finger or thumb positions. The torch head is low profile to fit in tight spaces, so it’s easy to use in smaller, home shops where there’s not lots of room to maneuver. It’s compact. At just 15”x6”x12”, it’s easy to pack away when you don’t need it. Previous buyers found that it was also a great choice for portable applications. They said the small package made it ideal for throwing in the truck to bring to the jobsite. At 22.5 pounds, it’s also light and manageable. The inverter supply cranks out steady DC power with rapid modulation so you get a consistent cut. The switch power inverter system allows for a much smaller and lighter transformer, with around a 30% boost in efficiency. It uses pulse-width modulation to make sure you’re getting a constant feed, which means a smoother edge in your metalwork. It comes with all the basic accessories you need to get cutting. This set includes the torch, with a nozzle, electrode, and cup installed, a ground clamp and cable, an air pressure regulator, and an air hose with two couplers and two clamps. It goes through consumables very quickly. Like other cheaper plasma cutters, the no-frills design is relatively inefficient. Be prepared to have lots of tips on hand. One other downside is that the recommended consumables are quite expensive. You can modify the tool to work with other consumables, as some buyers reported, but that would void the warranty. Quality control is fairly shoddy on this one. Thankfully, we found that in most cases, if something went wrong, it went wrong quickly. It was a bummer, but much easier to deal with in the return window. We’ve found that shoddy reliability is par for the course at this price, but assuming you’re in the majority of purchasers who get a well-made machine, you’re getting a bargain. So, for budget buyers, we think this one is worth a shot. The manual isn’t included in the box. It’s available online, but that’s less convenient for some people. It doesn’t cut quite as thickly as rated. This one is rated up to 1/2”, but we wouldn’t really recommend it for cuts over 1/3”. This is on the lighter end of the market for plasma cutters. Buyers had very mixed experiences with Lotos customer service. While some said they reached out with questions and received very prompt responses, others said they had problems getting in touch with someone at the company. Our next recommendation provides a big boost in build quality and power while maintaining a relatively low price point. This AHP cutter powers up to 60 amps (1/6 more than the Lotos), with a continuous arc that helps you cut tricky surfaces like rusted or coated metals. Previous buyers said they had no difficulty cutting through painted surfaces. We recommend it for more dedicated DIY enthusiasts, as well as people who want a more dependable tool for lighter shop work. It’s 1/6 more powerful than the Lotos. That allows it to cut up to 3/8” at 110 volts, and up to a full inch at 220! That’s a big boost over the Lotos, which at optimal conditions can only do 1/2”. While you’ll have to work a bit more slowly at those thicker gauges, previous buyers said you can still get a very clean cut. They said that on 220 volts, it was like an exacto-knife. It’s still compact. This one’s only a few inches larger than the Lotos, and packs a lot more power in its case. The continuous pilot arc produces very smooth cuts. This unit also has a commercial-grade cycle which keeps the power feed incredibly constant. The smoothness means better efficiency as well, so you won’t burn through as many combustibles as you would with the Lotos. It works on rougher metal surfaces. While a lot of other cutters are designed to work at ideal conditions (which are rarely the case when you’re doing DIY or working in a busy shop), this one’s continuous arc is rated to work on rusted, corroded, painted, and coated metals as well as those brand new pieces. That’s ideal for people who are doing salvage work, restorations, or other re-use projects. Previous buyers agreed overwhelmingly that this one is a great all-around workhorse. They used it for auto restoration parts fabrication, gun modifications, and metal sculptures-among other projects. Plus, the fact that this works on rough surfaces saves you money and effort when you’re sourcing scrap metals! It has better quality control than the Lotos. We found far fewer reports of issues, and the buyers who did have problems said they were resolved easily. It’s also covered by a 3-year warranty, which is much better than the 1-year coverage on the Lotos. AHP customer service has a better reputation than Lotos. Most buyers didn’t have any problems, but the few who did said that the company responded promptly, and that repairs were quick and smooth. Even though this is twice the price of the Lotos, this one’s still half the price of some top-shelf models. For the quality of the power cycle inside, combined with the reliability of the tool, we think it’s a real bargain. In includes a power adaptor, which allows you to use the machine at either 110 or 220 volts. While the Lotos works at dual voltages as well, it doesn’t come with an adaptor. You also get the hose, nozzle, and clamps you’ll need to get cutting. Previous buyers report that while the tool does function at 110 volts, it really needs 220 volts to do a good job. They recommended making sure you’ve got a 220 feed in your shop, if at all possible. This one’s our least expensive American-made cutter. It’s a much more reliable, convenient choice for light cutting work than the AHP or Lotos. We love the built-in air compressor, as well as the ergonomic design. It’s also extremely convenient to use, since it works on standard electrical feeds. This is one of the best tools on the market for home DIY enthusiasts, or small shops looking for a superior, portable tool. Unlike the AHP or Lotos, this one has a built-in air compressor. It’s piston-driven, so it packs surprising power in a small package. That makes it a lot more convenient to use, especially on the go. You don’t need to set it up next to the compressor in your shop, and you don’t need to lug a compressor around to other worksites. The other big benefit of having a compressor built in is that the pressure is preset. You’ll have optimum cutting conditions for each task without you having to make any adjustments yourself. It’s actually one of the only models out there with this feature. Even though it’s a more complete system than the Lotos or AHP, it’s very nearly the same weight. This one’s only 27 pounds, less than 5 pounds more than the Lotos! There’s a handle built into the casing, too. Previous buyers found the design extremely convenient. They said it’s easy to carry,and appreciated not needing to carry an air compressor in addition to the cutter. It’s built right here in the USA. It’s made by a commercial-class tools company. As such, it has a number of smart design features which make it easier to use, as well as more reliable than the cheaper options for regular and long term use. It has special cooling features on the torch tip and electrodes, which help dissipate heat after you’re done with a cut. The cutting arc also starts with a smaller pilot arc, which doesn’t require surface contact. That helps you get more use out of your tips and combustibles. It also makes for easier starts on rough, corroded, or coated surfaces. It works–and works well–on standard electrical feeds. That’s one of the biggest advantages over our two cheaper recommendations. While both those cutters can technically work at dual voltages, they really need 220 to work well. That means installing a special hookup, which can cost you a fair bit of money. Separate hookups also limit you by tying you down to wherever your 220 socket is. The Hobart works absolutely anywhere. The most impressive feature for us is that it doesn’t compromise power or cutting ability at the lower voltage. Unlike the other two tools, this one doesn’t see a drop in power when you use standard plugs. It’s rated for cutting 1/8” steel, ¼” mild steel, and 1/16” copper, aluminum, brass copper, and galvanized surfaces. That’s not quite as thick as the other two can handle, but the Hobard cuts more cleanly. There are LED alerts built in. They give you a quick reading on power, temperature, and torch readiness, so you’re never playing guessing games with your cutter. It’s rated up to 104 degrees Fahrenheit, thanks to the special thermal overload protection. The system automatically slows its duty cycle down as temperature increases. That prevents excessive buildup and damage to the internal components. If airflow is impeded, or the unit is overheating, the system will automatically shut off to protect itself. It’s not much more expensive than the AHP. Previous buyers said they were very pleased with the value for money, since this one doesn’t cost nearly as much as most other American cutters. It’s covered by Hobart’s 5/3/1 warranty system, which provides between 1 and 5 years of coverage depending on the specific component. It’s not for thicker metals. Due in part to the use of household electricity, this one can only cut up to 1/8” or so. That’s about half the depth of what the Lotos or AHP can handle, although most DIY metalwork generally stays around or under the 1/8” range anyway. It’s more expensive than either the AHP or the Lotos. While it’s unquestionably a higher-quality machine, the fact that it won’t cut thicker metals might be a deal-breaker for some buyers. This Hypertherm might be twice as expensive as the Hobart, but it also packs twice the punch! 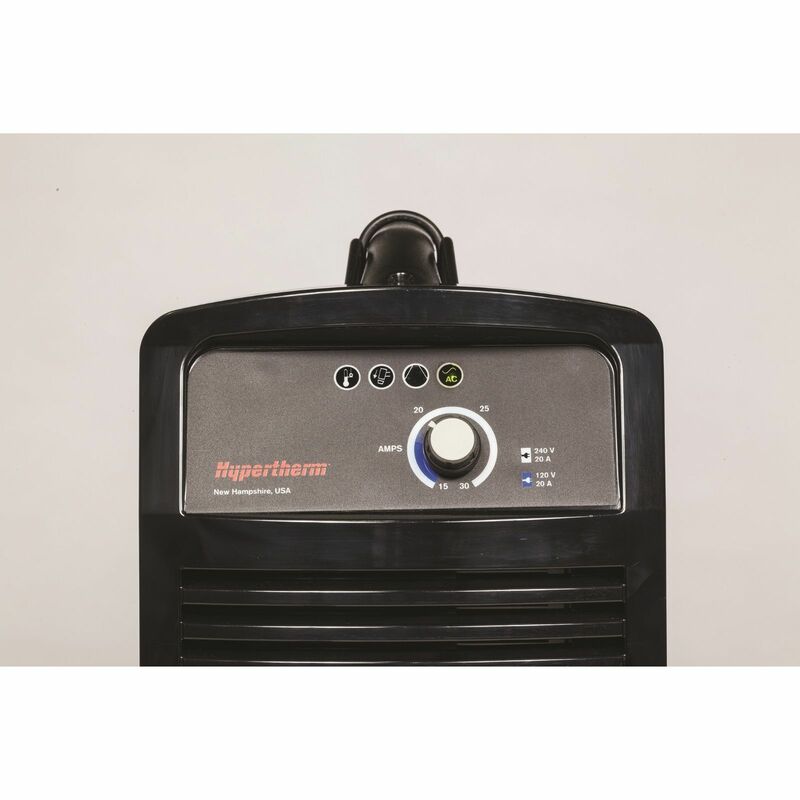 The Hypertherm Powermax 30 is our midrange pick for those looking for a balance of power, quality, and affordability. It’s American-made, and will cut up to 5/8″. We especially like that it incorporates both high-power and precision cutting modes into one design! It’ll cut more than twice as thick as the Hobart. That’s because it packs more than twice the cutting power, at 30 amps. The Powermax 30 can cut up to 3/8″ clean, and it’ll tackle up to 5/8″ for severance. It cuts anything, too. Stainless steel, aluminum, or mild steel are all pieces of cake–even if they’re rusted or painted. This thing goes through it all like butter, as long as you don’t go over the thickness specs. All you need to run it are your consumables and compressed air. No gasses required! The Hypertherm has a surprisingly low draw, too. You only need about 3-3.5 CFM from your compressor for this one. So, as long as you’re doing smaller cuts, you can get away with quite a small portable compressor. You have lots of room to maneuver, since there’s a 15′ lead on the torch. The hose has strain reliefs are fitted to both ends, making it a heck of a lot hardier than other compact units we’ve reviewed. This one will hold up to jobsite use with no issues. The grip is even better than the Hobart’s. It’s resistant to both heat and impacts. This is a very simple system to navigate. You just have to deal with one power switch and the one-knob interface for controlling your torch. There are also two cutting modes to choose from. The Hypertherm can cut at high power for thicker materials, or you can turn it down to make very precise cuts on thinner stock. In either application, it’s extremely tidy. Cuts are very clean on the high-power mode, and close to perfect on the fine. It’s professional-grade in every respect! All the parts have been well-designed, and we can’t find anything on this one that doesn’t feel impeccably-made. There are certainly more powerful systems on the market, but we don’t think you’ll beat this thing in the quality department! It’s everything you want from an American-made tool, and wildly better than Chinese imports in terms of precision, consistency, or reliability. It runs on both 110v and 220v circuits. The Hypertherm actually adjusts itself to the power source, so you don’t have to do any conversions to get up and running. Adapters for both power lines are included in the box. Even though it’s twice as powerful as the Hobart, the Powermax 30 is still very portable. It weighs less than 10kg all told, and comes with its own carrying case. This isn’t some chintzy bag, either. It’s a very nice hard plastic toolbox with locks. We love that there are consumable compartments built into the design. While it’s certainly at the pricier end of the spectrum for the power it provides, the Hypertherm isn’t short on accessories. As well as the cutter and torch units, you get a carrying case, eye shields, gloves, and a shoulder strap. There are also stocks of consumables included for both high-powered and precision cutting modes. The electrodes, nozzles, swirl ring, and retaining cap are all in the box. It’s covered by a 2-year warranty on the cutter unit and 1-year warranty on the torch. This system also has an excellent reputation for reliability. Hypertherm has been on the market a bit less time than Lincoln or Miller, but they’ve quickly established themselves as solid competitors at the top of the quality scale. Unlike the Hobart, it doesn’t have a built-in air compressor. If you prefer a system with one built-in, go for the Powermax30AIR. Otherwise, plan to use it with a compressor that can supply 3-3.5 CFM on a steady duty cycle. This is a higher-end American-made system. Because American build quality and reliability comes at a steeper cost, you pay a lot more for the amount of power here than you would with a Locus. If you don’t care as much about long-term reliability and exact precision, you might make do with a cheaper Locus or the AHP above. If you need more power, and want to keep the high level of quality you get on this system, you’ll have to spend more for our pricier picks. Hobart’s Airforce 40i is a lot like the smaller 12i we’ve recommended from the same company. It’s a precise, capable plasma cutter that’s ideal for working in lots of locations where portability is key. This model is nearly 4x as powerful as the 12i, though! It’s our top quality choice for anyone who doesn’t need to cut more than 5/8″ or sever beyond 7/8″. It’s 1/3 more powerful than the Hypertherm Powermax 30, and nearly 4x as powerful as the Hobart Airforce 12i. With 40 amps under the hood, the 40i can slice through steel at up to 5/8″ with incredibly neatness. It’ll sever metals as thick as 7/8″. Those specs are all rated for a 50% duty cycle. The most important thing about the Hobart’s specs is that it achieves them without using nearly as much amperage as a lot of the competition. Smart power management inside the machine reduces amperage draw by as much as 30% over competing models! That’s huge when you’re working on extension cords. As with our other high-end, American-made picks, this one will go through any sort of deformity or corruption on metals. It has no trouble with rust, paint or other environmental degradation. It cuts fast, too–much faster than oxy fuel and faster than any of our cheaper picks. You’ll be surprised how fast you can move through workpieces, even at the top end of the Hobart’s range. Like the smaller 12i, this larger Hobart produces very little slag, and has superb results as far as neatness is concerned. One thing we really appreciate on a unit as powerful as this one is how tightly it contains the heat-affected zone. You don’t have to worry about warping at all! The Hobart’s most impressive feature isn’t actually visible from the outside. It has a superb cooling system built in. The fans are efficient, and they’re designed only to run when necessary to save energy and reduce contaminant intake. The air channels are also re-engineered to keep airborne contaminants away from internal components. Like the Hypertherm, it has a single control knob.You don’t have to tune the flame with gas pressure settings the way you do on a lot of the competition. All you have to do is load your consumables, switch the unit on, and dial in your amperage. The internals deal with voltage fluctuations without translating anything to the cutting tips. That’s a big boon on worksites in particular! It’ll take care of anything up to 15% variation. The Hobart has thermal overload protection built in, as well as LED indicator lights to let you know what’s up if something goes wrong. The torch is similar to the one on the 12i, but with some subtle improvements. It’s slightly more ergonomic, and feels more balanced in the hand. It also disperses heat faster, and has a more flexible lead attached. Inside, there’s a precise arc controller and automatic re-firing system. Since the torch cools more efficiently, your tips last longer! This thing might pack a lot more power than the smaller 12i, but it’s still super portable! The 40i has a built-in handle, and a very compact frame. It’s actually lighter than the Hypertherm Powermax 30, even though it’s more powerful! It comes with a drag shield, deflector, air fitting, consumables, and all the basics you need to get up and running. Setup is super quick with this thing. It has the same 5-3-1 warranty as the 12i (1 year of coverage on the torch, and 3 on the internals), and a similarly impressive reliability record. Unlike the 12i model, this one doesn’t have an internal air compressor. You’re going to need to hook it up to an external supply. You’re going to need an industrial power supply, too. This one only runs on 240v. That’s one key reason we don’t recommend it to people who don’t do metalworking professionally. Even most passionate amateurs aren’t going to have an industrial hookup handy. One exception might be farmers, who often have high-powered hookups for working on equipment. Make sure you have a 50-amp breaker handy! It’s an absolute must with this thing. This is mighty pricey, even if it’s not quite the most expensive model we recommend. It’s about 30% more costly than the Hypertherm Powermax 30. Nobody but pros or the most passionate hobbyists should consider spending this much. It doesn’t come with nearly as many tools and accessories as the Hypertherm set above. It also has a shorter lead, at 12 feet compared to 15. It’s limited to less than 1″ cutting depths. If you need to cut 1″ stock, you’re going to have to bite the bullet and invest in the Hypertherm Powermax 65 below. Unless you want to seriously cut corners by using a Lotos or or AHP, the Powermax 65 is the only system we wholeheartedly recommend for the most demanding tasks. If you’re looking for the absolute best of the best in your new plasma cutter, the buck stops here! While it’s not a casual purchase for even professional buyers, this flagship Hypertherm model is actually one of the most popular plasma cutters out there. It’s a favorite among metalworking shops and with people who have farms or auto repair businesses. Fun fact: this one’s actually used at the Kennedy Space Center! It’s compact, maneuverable, and has a 25-foot range. For the best all-around performance and convenience on the market right now, look no further! It comes with the longest range of the bunch. This one has a 25’ lead, so you’ll have no problems where maneuverability is concerned. It’s the most powerful to boot! This is our ultimate pick for heavy-duty cutting and gouging. With a massive cutting force of up to 65 amps, it’s rated to cut clean up to 1”, and to sever 1 1/4″ steel. That’s as thick as anybody needs, even demanding pros. This thing is seriously fast, too. It’s tested to be 150% faster than oxyfuel! Plus, Hypertherm is conservative about their ratings, unlike other companies. While some makers will rate a tool for 1”, when realistically it’ll do 3/4”, some professional testers have found that the Powermax would actually cut beyond its specs in their applications. Of course, your results will always depend on your power supply, air feed, and metal conditions. Whatever thickness or material you cut within its capabilities, the Hypertherm leaves very clean edges, and the least dross and waste we’ve ever seen! As with the smaller Hypertherm we’ve recommended, there’s a fine mode as well as the full-power blast. It works with Hypertherm’s FineCut consumables for precise, smooth lines on fine pieces and small cuts. The Hypertherm is a smart system as well as a powerful one. It automatically adjusts to the cutting environment as you work, so all you have to do is tweak your amperage as needed. The internal system will set its own gas and air pressure for the best results! It’s equipped for drag cuts like the Hobart above, and comes with a shield. The Powermax 65 packs the best torch we’ve ever reviewed. It’s basically a souped-up version of the one that’s on the 30 above. It’s ergonomic, efficient, and rugged. Hypertherm makes a range of torch styles to fit this system, so you can get a few and customize your setup for each job! The consumables are actually less expensive to buy than those sold for other cutters. That’s a surprising advantage for a premium tool. Plus, the Hypertherm is much more efficient than cheaper tools, so it doesn’t burn through tips nearly as fast. To help with its efficiency, and to protect internal components, this unit includes a special cooling system. It also has an automatic shutoff, thermal overload protection, air filtration system, and other smart design tweaks to make it reliable for the long term. Like the Hobart’s, it has a system for compensating for air and power irregularities. The Boost Conditioner feature moderates electricity, and conditions power before it passes through the arc. There’s an internal air pressure regulator as well. The torch is very smartly designed. It uses a conical flow shape to increase the energy density of your arc. That results in a cleaner, sharper cut, with much less dross than other cutters produce. It’s also built around a dual-angle design, which burns consumables much more efficiently and preserves the life of the torch head. It comes with both a gouging tip and a cutting tip. Although this is a massively powerful tool, it’s relatively compact and manageable compared to competitors at a comparable power grade. The Hypertherm weighs less than 60 pounds all told, including the torch and lead. Like the Hobart and smaller Hypertherm models, it’s made in the USA. We couldn’t find a single complaint about quality control, as you expect at this price. Hypertherm also provide excellent customer support. They also go out of their way to provide manuals, information, and helpful specs. These machines are highly durable, reliable and have excellent resale value. The system is completely covered by warranty. You get between 1 and 3 years depending on the specific component. The outstanding versatility, convenience, and reliability makes this one more than worth the cost in the end. We don’t think anything else on the market can even compete with–let alone beat–the Powermax 65. It’s an insanely good tool. A lot of professionals have told us it paid for itself after a job or two, because they could use recycled and resourced metals that were ordinarily too thick to cut. Plus, since it’s so efficient, they weren’t purchasing nearly as many consumables. It’s expensive. This is one of the priciest systems on the market, not just in this guide. We only recommend it to people who make their living working with metal. If you fall into that category, or are a demanding non-professional user who has to cut a lot of thicker materials, it’s absolute gold. This one might be light compared to other 1″ cutters, but it’s still quite heavy It’s not something the casual user would want to lug around. Only get it if you need it! The long lead might be overkill for some users. It’s nice to have so much range, but you have to remember that you’re going to be winding up the lead after every use. If you’re on a tight budget, the Lotos is the obvious choice. It’s the least expensive cutter here by a long shot. While it’s not the most reliable or powerful of our recommendations, it offers all the essential features you need to get cutting without making a major investment. If you can afford a little more, but still don’t need a $1,000+ professional-grade tool, we highly recommend the AHC. It’s more reliable than the Lotos, and has some smarter features which help it work with rougher, rusted metals. This one’s the best choice for cutting thicker materials on a budget. For buyers who want the most convenient option out there, if not the most powerful, the smaller Hobart (Airforce 12i) is a fantastic choice. It’s not quite as strong as the AHC in terms of amperage, but it makes up for its lack of brawn with lots of smart, convenient features. We love the built-in air compressor for portability, and the ability to use household feeds. Because you don’t have to have an air tank with you, and can operate without 220v power, this is our most convenient recommendation. If you need more power, and and want something more reliable and efficient than the Lotos, we strongly recommend the Hypertherm Powermax 30 unit. It has a nice midrange cutting capacity, and is as well-made as any of our recommendations. While it’s not the most powerful tool here, it’s the best choice for the average user who wants something high-quality. If you’re looking for a professional-grade tool for materials up to 5/8″, the Hobart Airforce 40i is the cutter for you. It’s extremely light and maneuverable for how powerful it is, and as long as you don’t need to cut up to and sever over 1″, it’s as nice as anyone needs. Finally, with the best compromise between the convenience, smart design, and power, as well as the best overall performance, we highly recommend the Hypertherm Powermax 65 to professionals looking for the absolute best plasma cutter out there. This unit is as maneuverable and versatile as anything in its power class, and can cut up to 1” steel with ease. We’re hard-pressed to find anything to complain about with this model, aside from the price tag. It’s probably overkill for the casual DIYer, but it’s an excellent choice for professionals who will use it enough to get their money’s worth. Plasma cutters are available from about $300 to $2,000+. The cheapest options are no-frills cutters with basic plasma arcs, simple triggers, and limited adjustments. The most expensive options are high-end models with ergonomic designs, superior maneuverability, and automatic air and amperage adjustments. If you need to get the job done on a budget, you can get away with spending less than $500 for a basic cutter. However, you’ll want to be aware that cheaper models aren’t particularly reliable, and they’re not very ergonomic to use. We recommend that serious DIY enthusiasts, farm workers, or home mechanics spend at least $750 to get a more dependable plasma cutter. While that’ll require you to spend more money up front, you’ll be less likely to have to buy a replacement unit. In many cases, budget models end up being more expensive in the long run because of repair and replacement costs. If you do professional metalworking, you’ll probably want to look at one of the $1,250+ options. These have the power, precision and reliability to stand up to commercial use. They’re overkill for most amateur and home users, though. Generally, you’ll be choosing between ergonomics and power. For example, at the $1,000 point, you’ll find models that are either very maneuverable but have limited cutting capacity (1/8” steel), or models that are no-frills and a bit awkward, but have the power to cut over 1” steel. So, you’ll want to decide which is more important to you: user-friendliness, or brute force. At the top of the range, you’ll find a mix of both, but you’ll be paying premium ($2,000) prices. These machines have fully-automatic features and adjustments, with ergonomic designs and great maneuverability. They also offer a wide range of power, and can cut up close to 1” steel. Be sure to think about the thicknesses, the densities, and also the conditions of the metals you’ll be working on. Most metalworkers cut pieces under 1/2” for most projects. However, if you’re working with larger pieces, you’ll definitely want to make sure your machine is rated for thicker pieces. Consider the specific types of metals you cut. For most cutting on mild steel, any cutter will do the trick (up to its rated depth). If you’re working on coated steels, galvanized surfaces, aluminum, or other types of metal, you’ll want a higher-end cutter with more power and adjustable arc settings. You’ll also want to think about the end goal. If you’re looking for a very smooth edge, make sure you round down from the cutter’s stated capacity. Most low-to-mid range cutters are rather optimistic in their stated capacities. That’s because they’re tested at optimum conditions which aren’t always possible in the real world. So, even if you’re supposed to be able to cut clean to 1/2″, going right up to 1/2″ might not result in a perfectly clean edge. To help you, most manufacturers list a “cut cleanly” depth, as well as a rougher “severance” depth. For example, if you need to cut 3/8” smoothly, look for something rated to over 1/2”. Pay attention to the differences between the clean/severance ratings, so you know what kinds of results you can reasonably expect from your unit. If you do salvage or restoration work, chances are you’ll be working with rusted, rough, or otherwise imperfect surfaces. Not all plasma cutters are designed to handle these conditions, so you’ll want to look for machines that are clearly marked to cut well on rough metals. Look especially for constant arcs, automatic refire, and other cycle improvements to help you get better starts and cleaner cuts on rough pieces. While it can be tempting to simply buy the cutter with the biggest amperage, it’s worth considering that most of us don’t actually cut 1” steel, especially not on a regular basis. You’ll want to think about your average cutting width, and judge accordingly. Always remember that even if a cutter can’t work completely cleanly at 1”, most can still sever pieces of steel. So, for those of us who occasionally run into a 1” piece, but not on a regular basis, a 1/2” standard cutter will probably work just fine. You’ll just need to grind your edge if it will be visible. Before you buy any new tool, you should always have a look around your shop or workspace, to make sure you have the right hookups, equipment, and space to make the tool work. Most plasma cutters are designed to work on industrial 220V electricity. It’s not common for DIY shops, so if you’re buying a 220V cutter, make sure you know whether you’ve already got one. If you’re in a professional shop or on a worksite, chances are you’ll be able to find a 220V hookup. If you don’t have one in your shop, and you’re looking at a 220V cutter, you’ll need to install a hookup. That usually involves having your utility company come by and set it up (~$500). When you’re considering that investment, do take into account the fact that lots of other professional-grade equipment runs at 220V. If you don’t have a 220V hookup, and aren’t planning on getting one, you’ll want to find a dual-voltage or universal voltage cutter. Some cutters work at both 110 and 220V, and some even work universally on any power supply you happen to be around. What’s the difference? Mainly power. 220V simply gives your cutter a lot more juice to work with. These cutters can handle thicker metals, and in much less time. However, for the average DIY enthusiast, 110 should work just fine. If you work on site a lot, or have less stable power, look for a cutter with a built-in buffer system. We’re big fans of these for getting more perfect cuts, even if you don’t have any serious power fluctuations. These units compensate for any dips or spikes with an internal transformer. The result is a much more steady arc. On a worksite, the compensator can make a big difference, depending on who else is working around you, and what type of generator you’re using. If you need lots of reach, whether for cutting underneath vehicles, or because of a cramped workspace, you should look for a cutter with at least a 10-foot hose. Generally speaking, the best range you can buy is around 20-foot. 10 is probably more than enough for most people, but your distance depends on where your power supply is, where your air tank is, and where your actual cutting space is. Plasma cutters can either be extremely reliable, or extremely temperamental. That’s why it’s so important to get a good one! We’ve found that under $500, you’re looking at some pretty chancy models. While they have basic warranty coverage, these models are prone to overheating, blowouts, and circuitry issues. That’s because of poor quality control and a lack of built-in protection features. More expensive models are more reliable, because they have better cooling systems and heat protections built in. They also will have better quality control, and an overall higher build sturdiness. To make sure your investment is protected over the long term, look for a few key things. First, you want to be sure your new tool is covered under a warranty. Look for at least 1 year of coverage, with 3 to 5 years on high-end models. You’ll also want to look for superior cooling systems, automatic shutoff features to prevent heat damage inside the cutter, and efficient torches which burn more fluidly and keep wear and tear to a minimum. If you haven’t found just the right plasma cutter for you and your projects, take a look at Amazon’s best-selling models here! You can compare prices for all of our recommendations, and check out other competing models that didn’t make our final cut.